This section is focused on tools and methods to access and use census tract demographic-economic measures. Median household income ($MHI), median housing value ($MHV) and other selected items are used to illustrate operations and options. 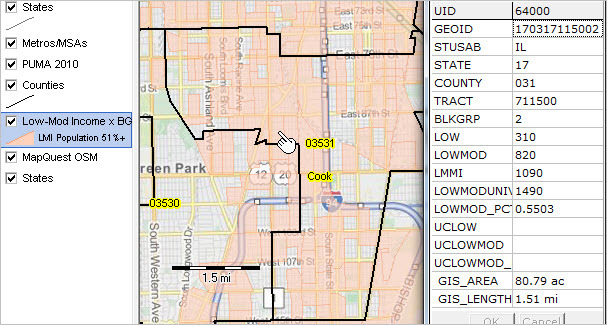 This section illustrates use of census tract data from the 2014 American Community Survey (ACS1014) 5-year estimates. 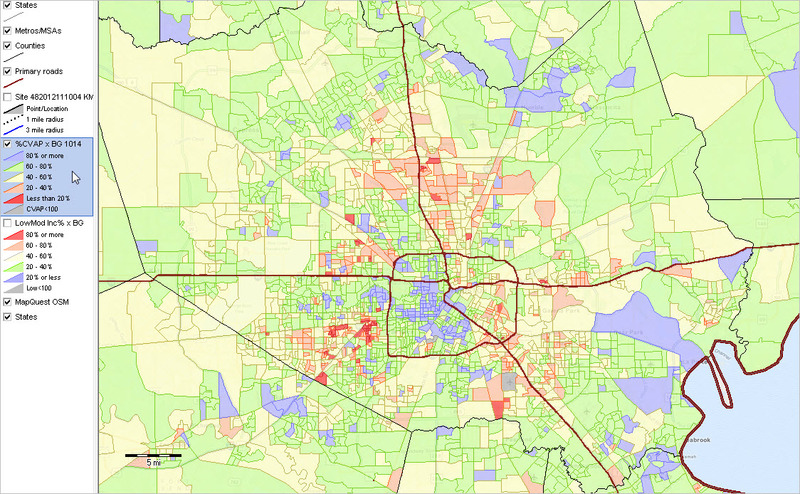 These are the most comprehensive demographic-economic data from the Census Bureau at the census tract level. These “5-year estimates” are centric to mid-2012. See more about 2010-2021 annual estimates and projections. Methods described here apply to many other geographies; see related tip sections. 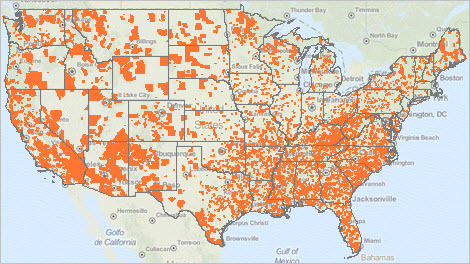 See related section on ZIP code applications. Five data access and use options are reviewed. Each method illustrates how $$MHI, $MHV and other data can be analyzed/used in different contexts. • Option 1 – View the data as a thematic pattern map. • Option 2 – View, compare, rank query data in interactive tables. • Option 3 – Access data using API Tools; create datasets. • Option 4 – View $MHI in structured profile in context of related data. • Option 5 – Site analysis – view circular area profile from a location. 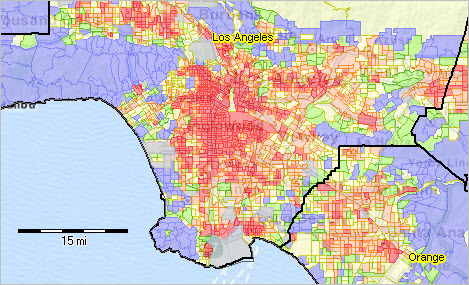 Patterns of Economic Prosperity ($MHI) by Census Tract … the following graphic shows $MHI for a portion of the Los Angeles metro. Accommodating different demographic-economic thresholds/patterns, different legend color/data intervals are used. The pattern layer is set to 80% transparency enabling a view of earth features. Click graphic for larger view, more detail and legend color/data intervals; expand browser window for best quality view. See details about each option in the related Web page. How to Assess the Hispanic Vote for the 2016 Elections? .. a good place to start finding an answer to this question is to use the Hispanic citizen voting age population (CVAP) data. We take a look at using those data here. 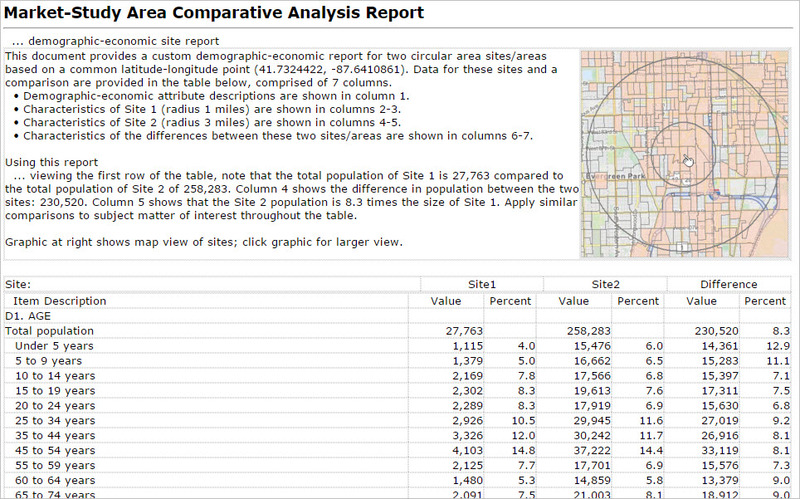 You can use these same tools and data to examine areas of interest. 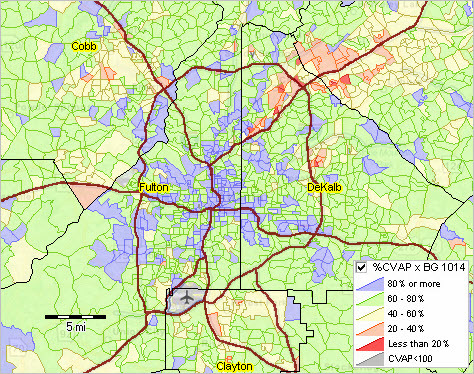 This section is focused on using census tract level CVAP data. 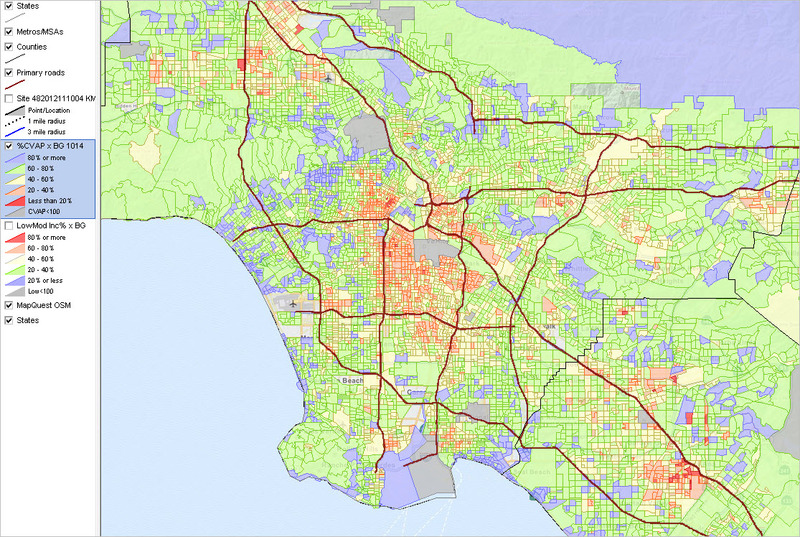 Census tracts cover the U.S. wall-to-wall with well-defined boundaries and average 4,000 population. 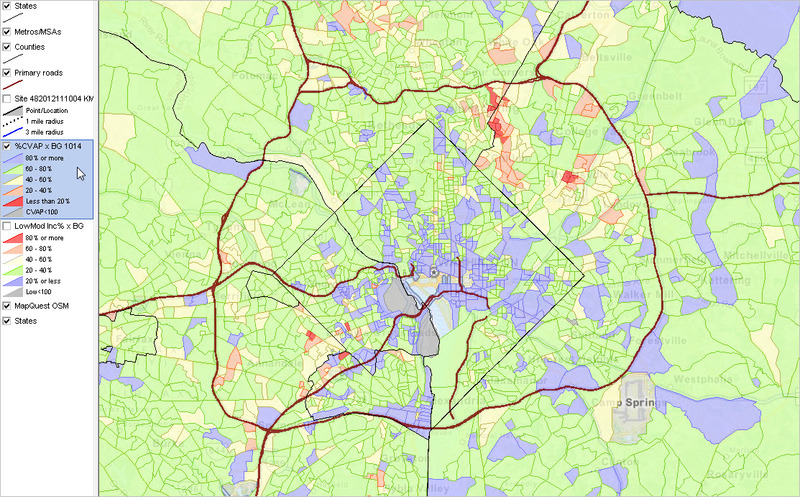 The 73,057 census tracts offer a good granularity to examine citizen voting age population for neighborhoods and sections of cities or counties. While the focus is on the Hispanic population, this population group is comprised of many specific origins (more about Hispanic population by specific origin). And, although this section is focused on the Hispanic population, the CVAP data are tabulated for several race/ethnicity combinations. We could apply these same tools to other race/ethnic combinations. 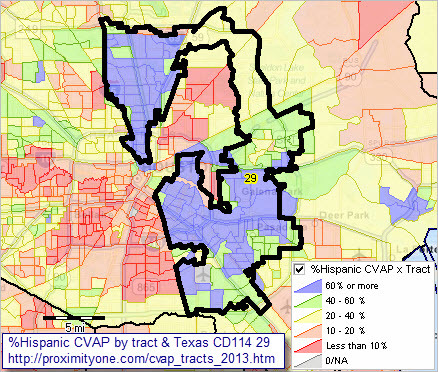 This map shows how Texas 114th CD 29 has many census tracts that have high concentrations and percent of Hispanic CVAP (see legend at lower right in graphic). 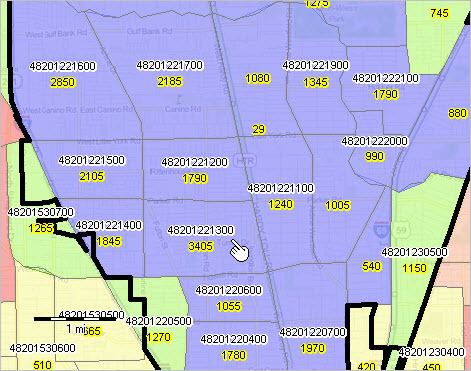 It is easy to where the Hispanic vote potential is by tract throughout the central Houston area. Develop thematic map patterns like this for any area of the U.S. Optionally link in voting districts/precincts, state legislative districts among many others. Modify appearance with different colors, interval/color assignments, labels among other settings. 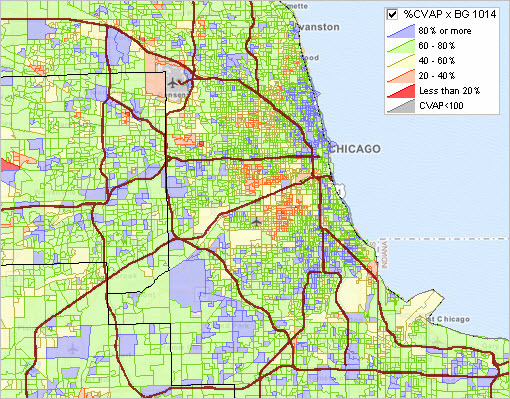 CVAP data are available for several types of geographic areas (states, counties, census tracts, block groups, among others) from the annually updated American Community Survey (ACS) CVAP special tabulation. 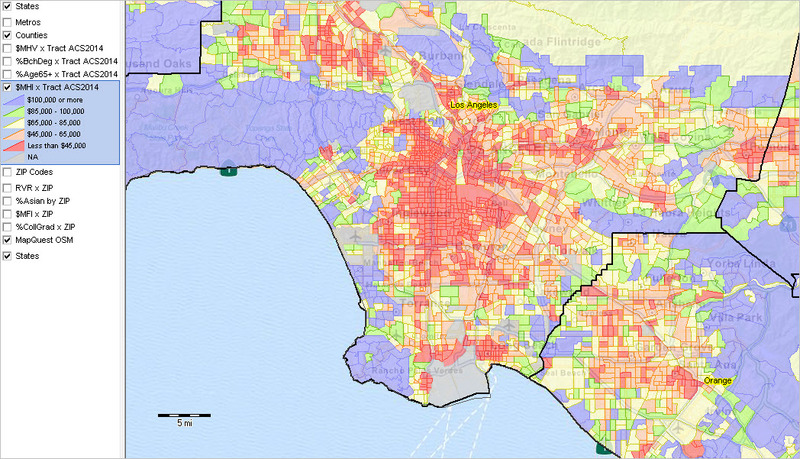 Identifying the census tracts having large numbers of Hispanic CVAP and high percentages, is a step one. But an important one. The next steps involve 1) determining the scope of the registered to vote Hispanic CVAP and 2) the registered to vote Hispanic CVAP turn-out on voting day or by absentee ballot. • Click ShowAll button below table (resets table). • Click CountyFIPS button below table. 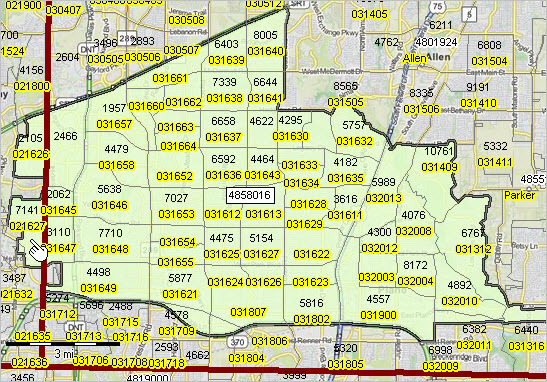 – refreshes table with only tracts in county 48201 (Harris County/Houston). • Click Hispanic button below table at far right. – refreshes table with same rows but now selected columns. • Click the “CVAP Hispanic” column header twice. 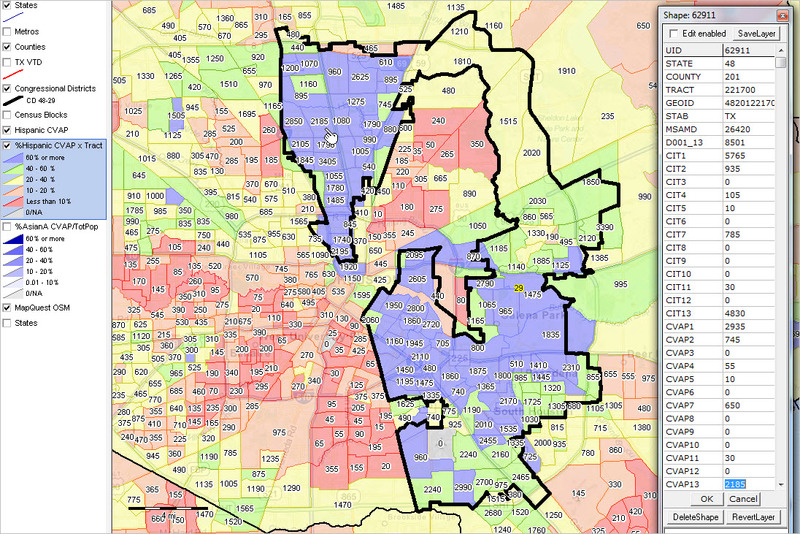 Tract 48201221300 has the highest Hispanic CVAP (3,405) among all tracts in Harris County (48201). This tract is shown in the map below (see pointer; a zoom in to the map shown above). 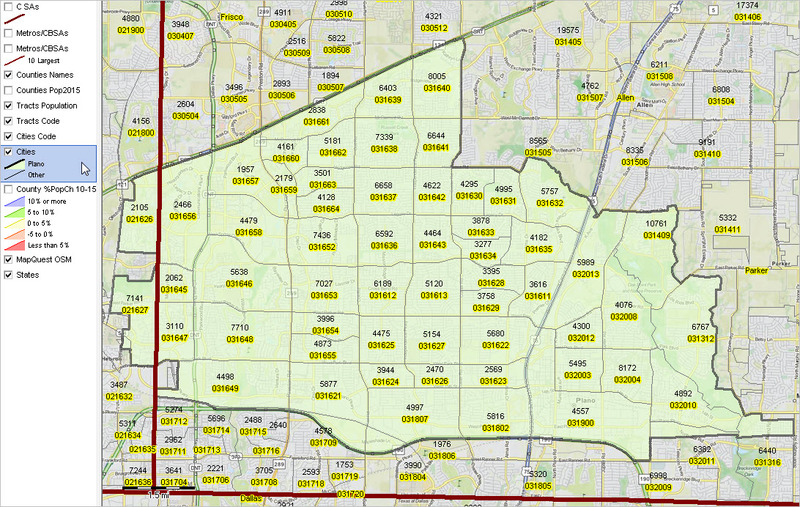 The tract is labeled with the tract code and the Hispanic CVAP population (3,405). 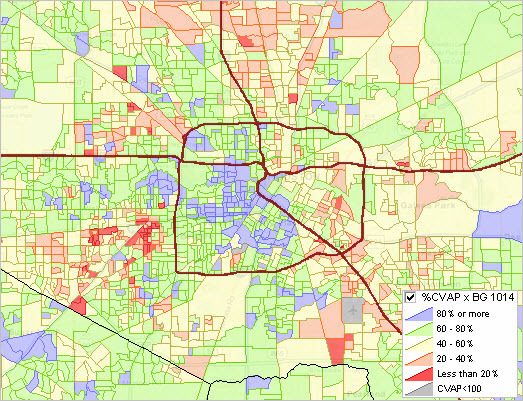 The CV XE GIS Site Analysis tool was used to examine CVAP characteristics for the set of census tracts intersecting with Texas CD 114 29. 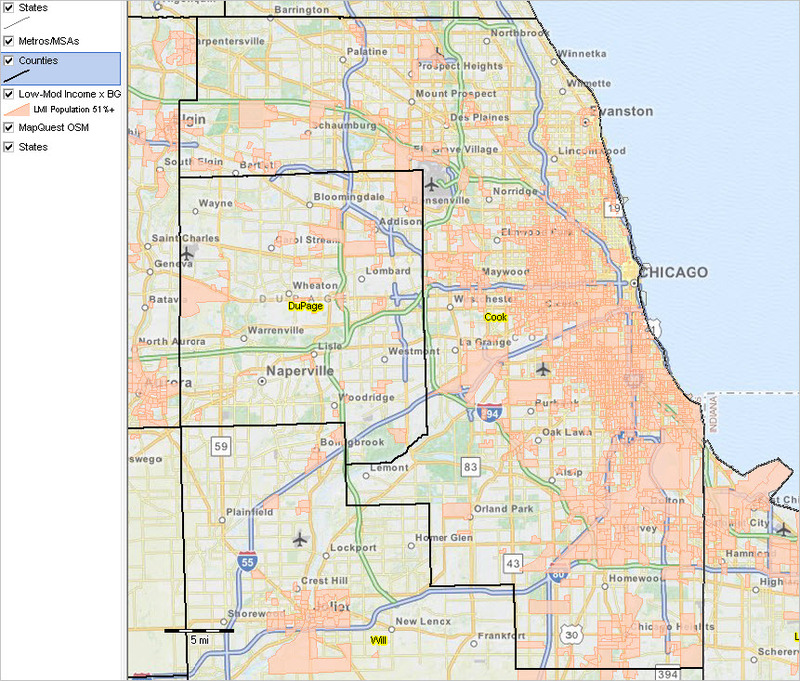 This is a close but rough approximation as census tracts are not fully coterminous with CD boundaries. In this case there are 136 tracts intersecting with CD 29. Approximately 98% of the composite tracts area is coincident with the CD 29 area. In the 2014 House election, the total CD 29 votes cast was less than 50,000. The incumbent won the election with 42,000 votes. Meanwhile, the total population for the 136 tract area was 708,709, the total CVAP was 332,060 and the Hispanic CVAP was 202,495 (ACS 2014 estimates). Roughly 150,000 eligible Hispanic CVAP voters did not vote. How to assess the potential impact of a further engaged Hispanic CVAP? Apply these same methods to any area in the U.S. to determine those census tracts having the highest Hispanic CVAP and the *potential* to have a relatively large Hispanic Vote in the 2016 Elections. Join me in a Data Analytics Lab session to discuss more details about analyzing characteristics of the citizen voting age population. Learn more about using these data for areas and applications of interest. What factors best determine where a clinic, hospital or professional practice is located? For those that exist, how to best determine the scope and needs of the market served? Understanding healthcare market dynamics is one way these entities can improve their business and operation by using Health Data Analytics. Professionals skilled with Health Data Analytics can help their organization, or clients, better achieve their vision and improve performance. This section is focused on analyzing healthcare markets and infrastructure using Geographic Information System (GIS) tools and related data resources. Participants in the Certificate in Data Analytics may optionally use the tools and resources described here. See overview of steps to install and use the GIS project and datasets illustrated in more detail in the related Web section. Illustrating GIS start-up view discussed in this section. – View developed using CV XE GIS; click graphic for larger view. Analyzing healthcare markets involves examining characteristics of healthcare facilities in context of competitive position and market potential. 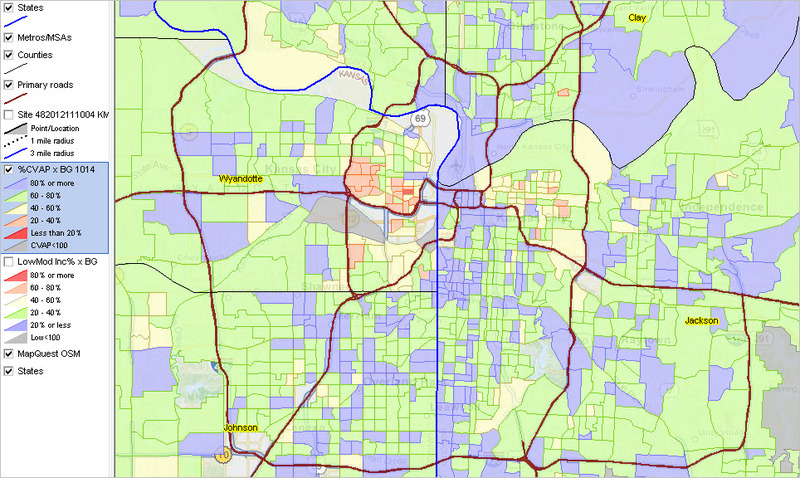 Geographic Information System (GIS) tools can be used to knit together geographic, demographic, economic and business data to perform these analyses. 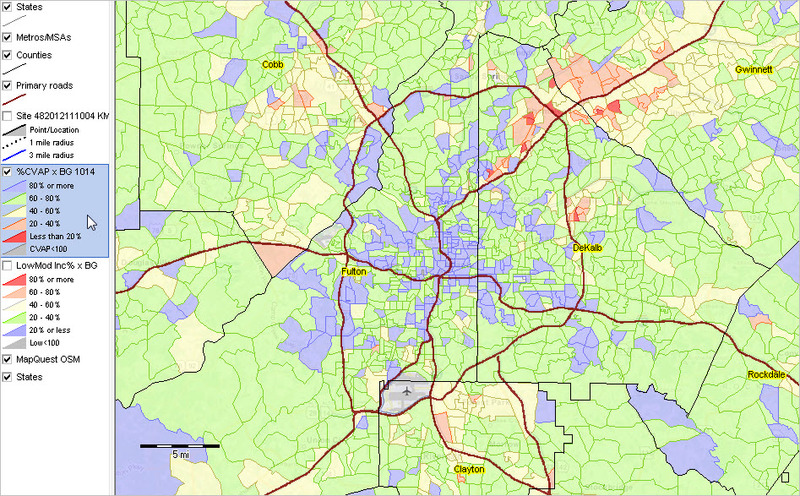 This document makes use of the Atlanta area to illustrate applications. In an actual study, the geographic focus could be a city, county, metro, state or some combination, anywhere in the U.S., or the U.S. overall. A first step involves an assessment of your situation — your needs, visions and data that you have to work with. 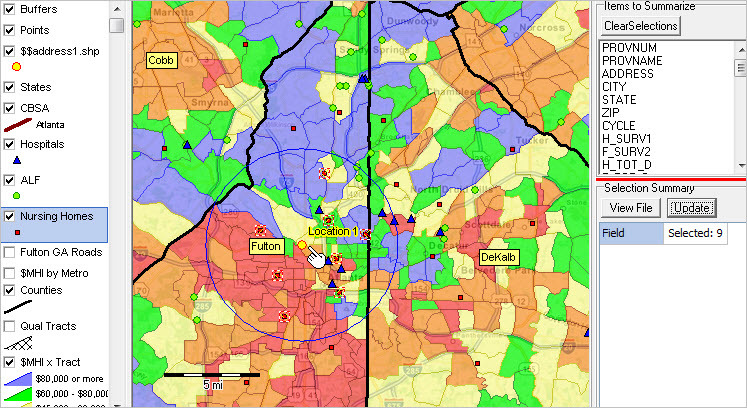 The results of this assessment and data that you provide help develop/frame a market study in context of GIS project(s). 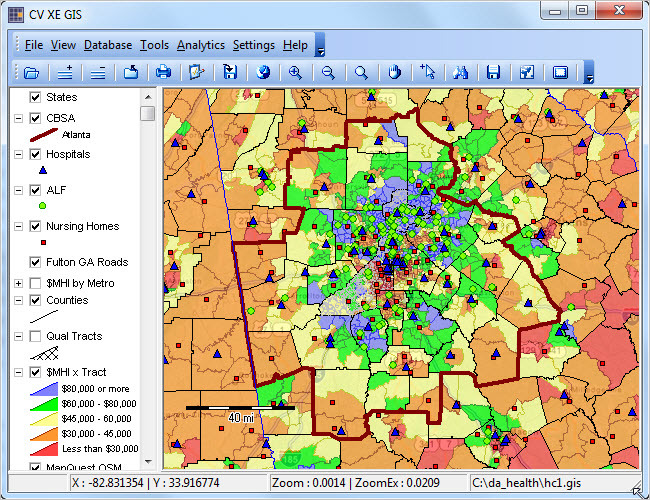 The following graphic shows the start-up view of the Atlanta area Healthcare Data Analytics (HCDA) GIS project. This GIS project involves use of many layers and types of data as shown in the legend at left of map window. Selection of the type of geography, scope of geography and scope of subject matter are key elements in setting up the market infrastructure analytical framework. This is a proxy/example for the GIS project that would be developed to meet your needs/application focus. 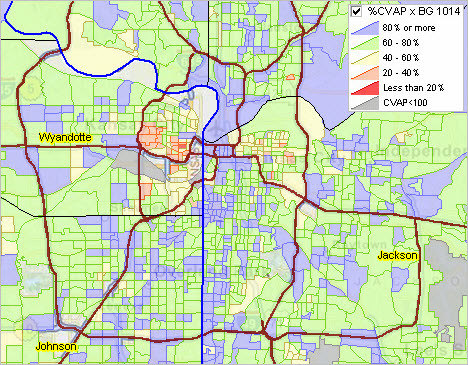 The above view shows a thematic pattern of median household income by census tract (averaging 4,000 population). 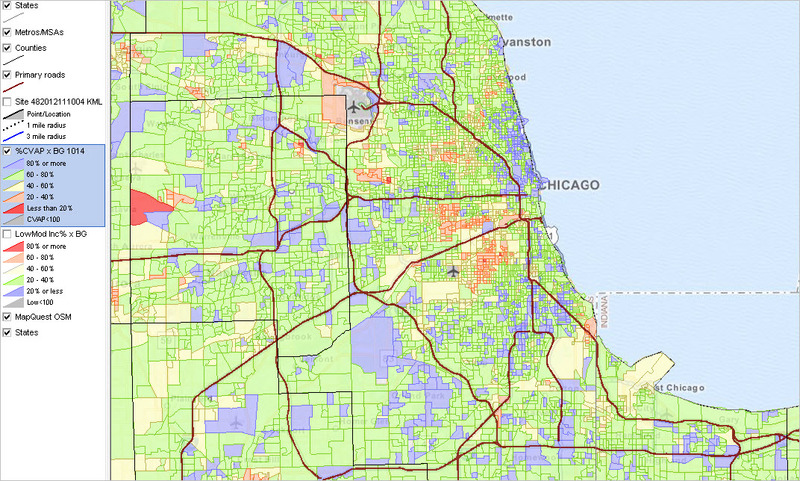 Pattern analysis helps you visualize demographic-economic characteristics by census tract — in this example you can easily see patterns of economic prosperity. This example uses median household income; we can draw upon hundreds of subject matter items and depict other types of patterns. The graphic below shows selected types of healthcare facilities. The yellow circle marker shows the hypothetical location of a prospective new facility. A 5-mile radius site study area — from the yellow marker — is used to select existing nursing homes; characteristics of the competition. Nursing homes show as cross-hatched; circular area is study zone. Display of the 9 facilities selected above. See the related Web section to view further details. Join me in a Data Analytics Lab session to discuss more details about using these data in context of data analytics with other geography and other subject matter. Learn more about integrating these data with other geography, your data and use of data analytics that apply to your situation.